When I go out to Old West sites, I'm always very aware of layers. Here's a good example: in Oatman, the town in western Mohave County, my family used to picnic there in the 1950s and my friends and I—mainly Rick Ridenour, Charlie Waters and Dan Harshberger—would play "guns" and we were thrilled to be walking along the streets of an actual 1880s Wild West town, when in fact, the town had gone belly up during World War II so many of the buildings we were awe-struck by dated from the 1930s and 40s, and not the 1880s. Add to that, the fact that Hollywood came to Oatman in the early 1960s and rebuilt part of the main street for a cinerama set piece that appears in "How The West Was Won" (1963). So, today, people walk the streets of Oatman thinking they are looking at the real Old West when they are actually looking at a movie set built on top of a Depression era mining town, built on top of an authentic 1914 mining camp. So, I am well aware of layers. Having posted a photograph of my recent trip out to the Oatman (the people, not the town) massacre site, my guide, Vince Murray and I speculated about the road up the bluff and, since it was quite developed (big boulders piled up on the sides, creating a very wide roadway) we wondered at length if it was a modern layer on top of the original road the Oatmans traversed on that fateful day in February of 1851. 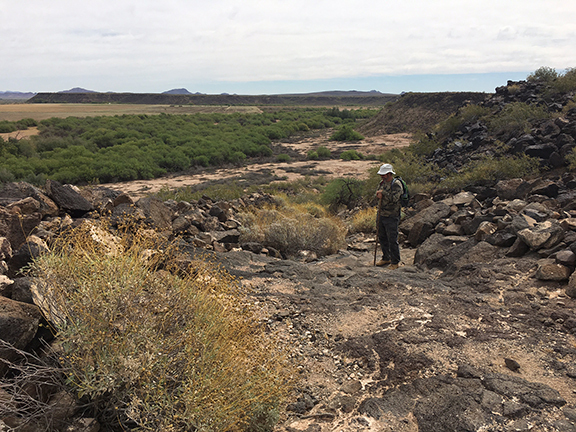 Vince Murray standing in the roadway on the approach to Oatman Flat. 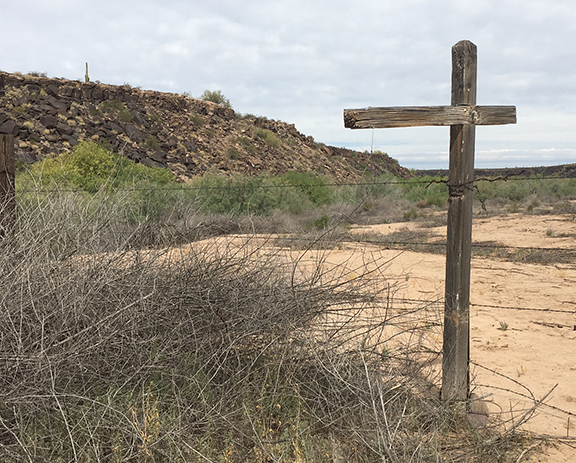 "From the photo of the trail it is hard to tell from the perspective, but it appears to be James B. Leach's alternative trail about 100' to the south of what is probably Cooke's Wagon Road used by the emigrants and the Oatmans. 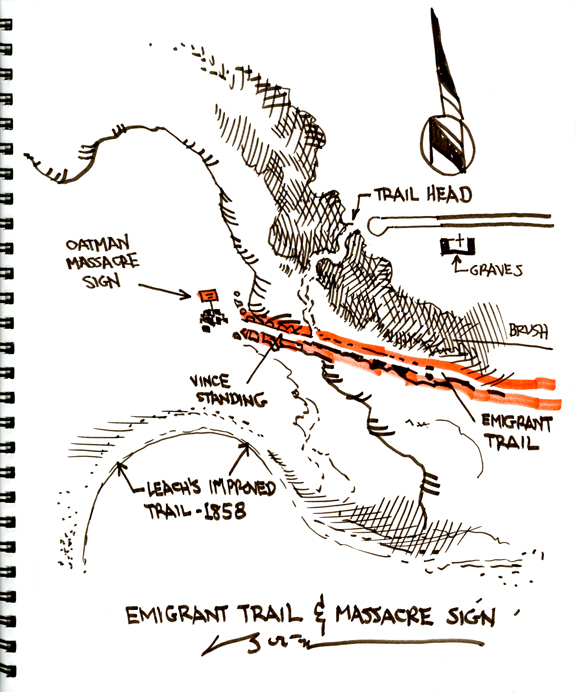 The massacre took place at the old ruined Emigrant Trail trail going over the side of Sentinel Plain, which fell apart sometime before 1858. The newer trail up the side of the mesa (Sentinel Plain), 100' to the south, can be identified as Leach's improvements, because of its width. 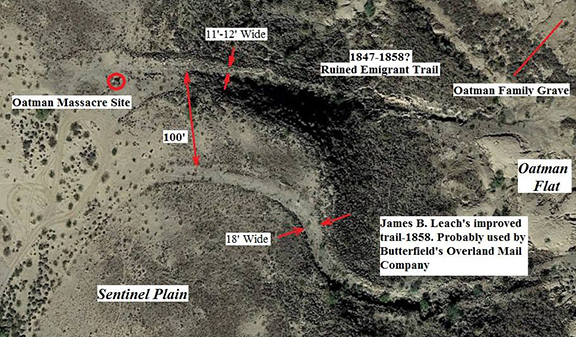 The windrows of rocks rolled back at the lip of the mesa on what is probably Cooke's Wagon Road measures 11'-12' apart. The windrows of rocks rolled back for Leach's 1858 road measure 18' apart. In Leach's 1858 report to the government he states that he improved the road by rolling the rocks back to 18' and on bends to 25' to accommodate 10 mule teams used by teamsters. Leach's road here was probably the trail Butterfield's Overland Mail Company used. Other sections of Leach's improved road can be seen on Sentinel Plain." 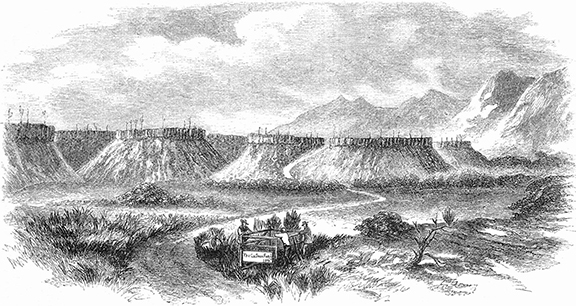 An 1860s illustration of the gravesite and the approach to Oatman Flat. The problem I have with this layer of the wrinkle is, I took a photo of the bluff to the north of this road and I don't see any trail, or even a faint, alternative trail. Do you? and shows Oatman Bluff as it appears to the north of the above cut, or roadway. Okay, here's an aerial view of what Gerard is talking about and although this is a little confusing to me, by my calculations, Vince, above, is standing on the Ruined Emigrant Trail. "Damn, now I need to go out there a third time!"